This week's eviction of RVs from an East Palo Alto street due to public health concerns sparked a protest; meanwhile, city leaders grappled with how to regulate RV dwellers while also helping them. Palo Alto Weekly journalists discuss the issue on this week's "Behind the Headlines." Watch the webcast here. Sigh. No complaints about auto wrecking yards which were the main source of EPA revenue which have mysteriously left. The same for ROMIC which generated a Superfund site. Yes, That area was abandoned by Palo Alto who shoved all their " undesirables " there by the practice of " Red-Lining ". Now a similar process is targeted at seniors who cannot afford EPA housing. How about just building a water treatment plant on the old ROMIC site and use the nearby excess land from the numerous wrecking yard sites as places were you can park RVs? And build shipping container housing for the underpaid workers in the uber-rich Palo Alto just like Hawaii is doing now? Each shipping container house costs just $7500 to build. These houses will not mar the view of Palo Alto, just like the wrecking Yards did when the businesses were thriving. And polluted more than these RVs have ever did. Yes, when high tides were highest, several wrecking yards were partially flooded by the Bay waters. So now you repeated what was done 50+ years ago. But your red-lining is about the same people you banished from Palo Alto 50 years ago. Making up a trailer park with container housing and add a waste treatment plant is the least uber rich Palo Alto CAN and should do. Doing the same thing over and over again and expecting different results is a form of insanity. It looks like Palo Alto is doing exactly that. Palo Alto is STILL a bully, just like the problems with the PAUSD. Worse, a DUMB bully. It does not take a rocket scientist to figure this out. Just a supercomputer scientist who did some growing up on Garden Street in East Palo Alto. Many of these RV dwellers are Palo Alto workers who can’t afford the Palo Alto rents and are living in RV’s as a last resort. This is definitely an emergency.! Wouldn’t it be possible for Palo Alto to finance a supervised campground space with sewer services and hot water services. This space could be purchased in or near Palo Alto. I say supervised because we know some irresponsible bad actors join the crowd. Several people have suggested that companies like Facebook and Google provide such a place for their workers who need it. the_punnisher wrote: "So now you repeated what was done 50+ years ago. But your red-lining is about the same people you banished from Palo Alto 50 years ago. Making up a trailer park with container housing and add a waste treatment plant is the least uber rich Palo Alto CAN and should do." Other than hating everything you think Palo Alto has stood for over the last 50 years, do you have anything specific you think the city should do? If you think RVs should be allowed on city streets-- how many? Any sanitation requirements? Are they allowed to block driveways? Are schoolkids OK? Any limit to the number of people allowed per RV? Can they run generators night and day? Do they have to move every so often? Be specific-- I would appreciate having a penthouse apartment on 5th Ave in NYC, but, am I -entitled- to it? 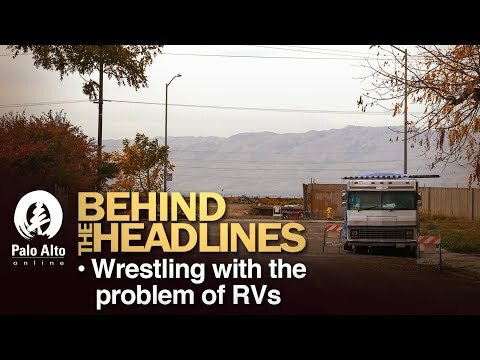 What is it that you think people are entitled to, and, why are RVs part of it?